Bubbles and Alaska are my favourite pets. They are rats. Once Bubbles was so desperate to get back into his cage that he jumped and hit the table that the cage is on. He used to bite. Once he bit Oz! I guess he is more tame now. Bubbles is quite lively and extermemly fast. Then there is Alaska who is big, fat and lazy. Oz likes Alaska because he doesn't bite! Alaska doesn't normally like to come out of the cage. My cousin gave the rats to me because she lost interest in them. 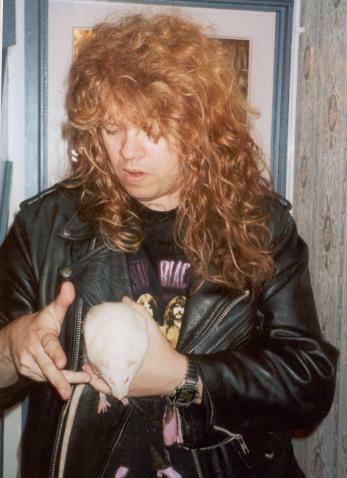 "How do you tune a rat?" On 30th April 2002 Alaska passed away. out to be a tumour and he never woke up after the operation. We buried him in the garden near Mindy. Me with Bubbles. I am trying to fit him into Oz's boot! 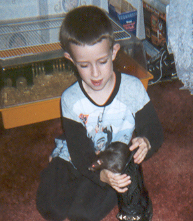 Sadly Bubbles died, from a stroke we think, in February 2003. He had been very quiet and lonely since Alaska went. Mindy was quite fat like Alaska but as fast as Bubbles. 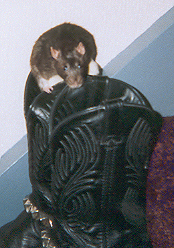 She was our first rat. We do not know why she died. Probably old age. Rats only live for a few years. I miss her so much. We buried her in our back garden.